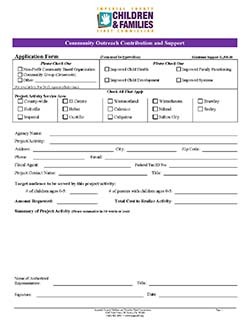 The First 5 Imperial offers agencies s with an opportunity to submit a Community Outreach Contribution Application to the Commission for consideration of support for activities that specifically target children 0-5 years of age. The maximum amount that may be requested is $1,500, though this amount is subject to change due to funding allocations approved of by the Commission on a year-to-year basis. Please note that the application was revised on October 5, 2017 by First 5 Imperial and therefore applicants should ensure that they adhere to the changes.